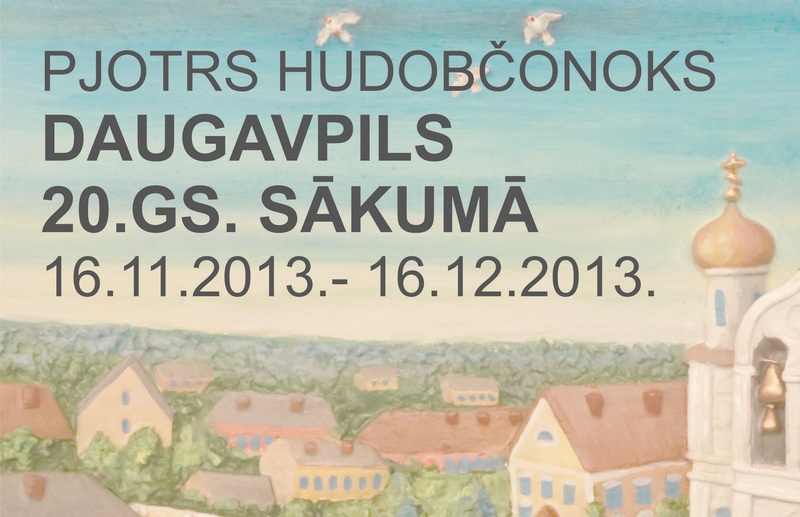 Five new exhibitions will be seen at Daugavpils Mark Rothko Art Centre from 16th November, 2013! New season of expositions at Daugavpils Mark Rothko Art Centre will offer the visitors to wallow in surrealistic world, created by artists during the dark months of winter. Mystical, fairy tale images portrayed in it will be perfect guides into the mysterious Christmas Eve. 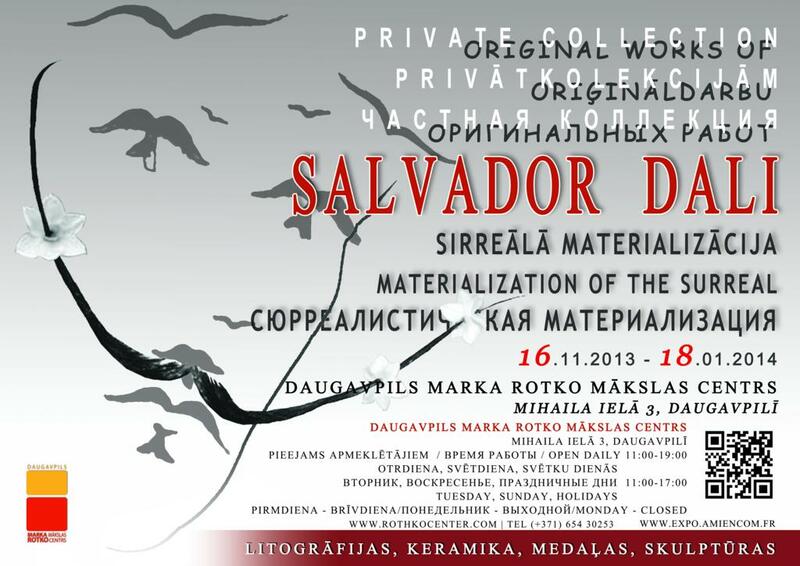 Exhibition of Salvador Dali “SIRREAL MATERIALIZATION” in the Project Exposition Sector (C), from 16th November 2013 till 18th January 2014. Salvador Dalī (May 11, 1904 – January 23, 1989) Spanish painter, graphic artist, sculptor, filmmaker, writer – one of the most famous representatives of surrealism. Salvador Dali was primarily an intellectual painter who showed viewers his theories and ideas through his works of art. In his opinion, it was more important to show not what the human eye sees, but rather what a person feels, thinks and experiences, perhaps not realizing it. The exhibition aims to help viewers see and understand how S. Dali materialised his surreal ideas and beliefs in his peculiar and original language of art. From 16th November 2013 till 20th January 2014 in the Project Exposition Sector (C) of Daugavpils Mark Rothko Art Centre will be the exhibition „DREAMS. CONTINUATION” of Eduards Pustovaitovs. Eduards Pustovoitovs– once a young man from Riga, sailor, who in the early 1990s, unintentionally visited a Modern Art Museum in Amsterdam and became a world-famous painter of genius, which is known as the discoverer of a new philosophy of art, Dali’s follower and the representative of surrealism. Americans call his distinctive style “expressive synthetism”. His deep works, full of mysticism, are hypnotic and can not leave the viewer indifferent. Juris Utans’ exhibition “FLAI – ĻETALKA – FLY” in Daugavpils Mark Rothko Art Centre, Contemporary Art Sector (B) from 16th November, 2013 till 20th January, 2014. Pjotr Hudobchonok’s exhibition “DAUGAVPILS AT THE BEGINNING OF 20TH CENTURY” in Sector B (Intro Hall) from 16th November till 16th December. Pjotr Hudobchonok (born in 1947) – well known person in Daugavpils, freelance artist, characterized by a distinctive style – his works are the synthesis of bright and colourful sculpture and painting, he is interested in portraying emotions and humanity. Social life themes close to the artist, Hudobchonok is portraying with the elements of eclectic nature. In Sector B from 16th November 2013 till 20th January 2014 textile and fibre art miniature exhibition „Song to the River Daugava”. Song to the River Daugava– a project dedicated to 95th anniversary of Latvian Republic Proclamation of Independence; textile miniatures exhibition, where participated more than 30 Latvian artists, who created works taking inspiration from and dedicating their works to the Latvian destiny river Daugava.